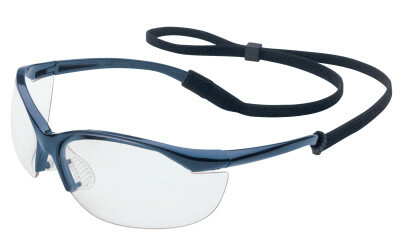 Vapor Eyewear, Clear Lens, Polycarbonate, Hard Coat, Metallic Blue Frame, Nylon | Safety First Services, Inc.
Lightweight eyewear with a contoured fit to the face for comfortable all-day wear. Features sporty 9-base wrap-around design with soft nose bridge. Comes with adjustable break-away Flexi-Cord™.